Need an eye exam in Durham, NC? Come see us at The Eye Center located in Southpoint Mall next to Lenscrafters! The Eye Center in Durham, NC is committed to providing comprehensive, gentle, quality eye care services in a comfortable, friendly environment. Our optometrists’ not only focus on your vision, but also read what your eyes are showing about your general health. We strongly believe that the eyes can give a person important information. 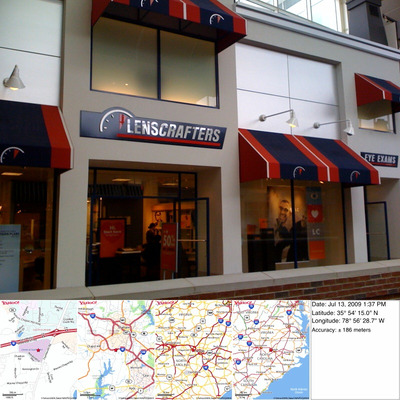 Our Eye Center office is located right next door to Lenscrafters in the Southpoint Mall. For more information about our location, directions to the Durham office or opening hours, click here. At the Eye Center in Durham we welcome our local University students’. Despite the friendly rivalry that has developed between Duke and NCCU in the Bull City Gridiron Classic, our optometrists’ try to stay neutral and provide great eye care to both fan bases. Just because you are far from home doesn’t mean your vision has to suffer. If those long hours of studying and sitting in front of the computer is causing headaches, dizziness or other bothersome symptoms, call our Durham office or book your eye exam online. Our eye doctors’ use AccuExam technology so that your exam is quick, accurate and painless. Additionally, we can upgrade your eyewear in no time at all. At the Durham Lenscrafters you can receive your new pair of glasses in about an hour! If you need contact lenses or other eye care products, stop by our office. So accurate, this technology takes the guesswork out of your prescription and gives us answers very quickly. At The Eye Center in Durham, NC our optometrists understand that early identification of a child’s vision problem is crucial. Full Diagnosis and Treatment of Glaucoma, Macular Degeneration, Surface Ocular Diseases and Injuries. The Eye Center also provides Emergency Services such as foreign body removal and conjuctivitis. Our Durhamoffice in the Southpoint Mall is located right next door to Lenscrafters, providing you with great choices in eyewear and AccuExam technology.